There’s the old phrase “if you love what you do, you’ll never work a day in your life.” Well I might see my career from this viewpoint but my wife doesn’t. To her, the persistent phone calls and evening/weekend appointments are all forms of work that take away from the time I could be spending with her and the kids. When you’re driven to be successful, it’s easy to let work overtake your focus and create problems in your personal life. If you don’t recognize that you are spending an unhealthy amount of time selling homes, you sacrifice your marriage and family life. In order to prioritize my family, I’ve had to strategically plan how I run my business. Here are 5 tips to help you maintain a work/life balance that will keep your spouse and kids happy. #2 – Get your wife’s input on best times for an appointment. I learned early on that before I scheduled my weekend appointments, it was best that I checked in on any existing plans involving my family. I would ask my wife for her preferred day and time for a weekend showing in order to minimize the inconvenience and show that I value her schedule as well. #3 – Let your cellphone battery die. This is hard but just let it happen. Take your dead battery as a sign from above that you’ve worked enough for the day. I use a backup battery that will last me till dinnertime. On those days where it dies in my pocket, I don’t charge it again until I go to bed and enjoy the feeling of being disconnected. #4 – Use an online calendar and give access to your spouse. This has been a lifesaver. My wife and I share calendars through Gmail. Whenever my kids have events or my wife has made plans, I am instantly aware and I can schedule around the family calendar. My wife can also see my calendar so she knows when I am working late in case I forget to mention it (which used to happen all the time). #5 – Overestimate how long you will be away. Total amateur mistake here. I was afraid of telling my wife for the 3rd Saturday in a row that I was working so I would try to minimize my time away. In order to avoid a fight up front, I picked for a fight on the backend when I returned home later than expected. I follow this same mantra in real estate as I now do with my personal schedule, “Underpromise and Overdeliver”. I now pad my time away so that I can better manage my wife’s expectations. 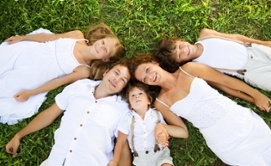 What’s your best secret to keeping your family happy? Post below and help me out!